This is an update with corrections to pages 106 – 108 of FDTimes April-June 2017 issue 81-82– along with additional information on lens mounts, sensor sizes, lens coverage, image circles, IB/E Optics Raptor VV T2.9 Large Format lenses exclusively distributed by Band Pro, Velociraptors, Lens Extenders distributed by AbelCine, LED Ring Lights for Raptors, and more. Download the free 4-page PDF. Hi Jon, missing the 8K Helium sensor which is 29.90 mm x 15.77 mm (Diagonal: 33.80 mm) and the C700 28.9 x 15.2 (32.6mm diagonal) if you really want to be up to date! Hi Danys, You are absolutely right. I will update. The chart grows! And from the looks of NAB, even more coming. 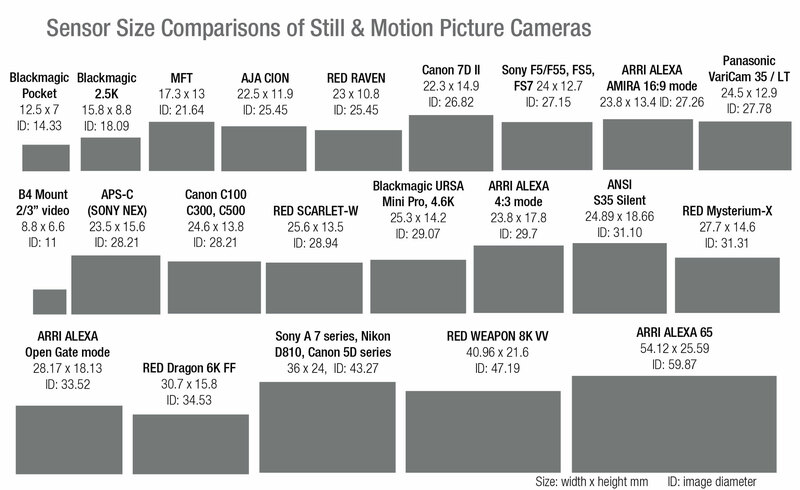 Maybe the dimensions for 2/3″ CMOS/CCD could be altered to the modern HD and 4K standard size of 9,6 x 5,4 mm. As far as i know all modern camera’s use this chip size ( GrassValley LDX series, Sony HDC and XDCAM series). It has a 16×9 aspect ratio and is related to the 1920 x 1080 HDTV standard. Every pixel has exactly 5 x 5 micron on such a chip.